Terence Mann: People will come. They’ll come to Las Vegas for reasons they can’t even dream (yet). They’ll land at McCarran not knowing for sure why they’re doing it. They’ll arrive at the Convention Center as innocent as children, in a childish (but pure) quest. It is money they have and solutions they seek. They’ll wander and discover. They’ll find geeks and gizmos and remember days before the Star Trek stuff started taking shape and forming reality. They’ll cheer their heroes. It’ll be as if they dipped themselves in magic waters. The memories and dreams will be so thick they’ll have to brush them away from their faces. People will come. The one constant through all the years has been technology. America has rolled by like an army of steamrollers fueled by the next generation of locomotive engine. Technology has transformed time. It’s a part of our past — and a glimpse of our future. It reminds of us of all that once was good and things yet to come. People will come. People will most definitely come. 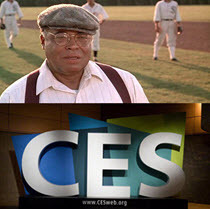 For those less familiar, this week is the Consumer Electronics Show in Las Vegas. It is the world’s largest trade show of its kind. The International CES (Consumer Electronics Show®) is the world’s gathering place for all who thrive on the business of consumer technologies. It’s where business gets done: on the show floor, in and around our conference program, in impromptu connections and in planned meetings and special events. Follow on Twitter via #CES2015. We’re working to schedule the January Round Table. It will likely be on Saturday morning, January 31 at 10:30 AM ET. The January Round Table will be part of a series of webcasts during Groundhog Weekend — more information to follow. Speaking of our 10-year anniversary and ALL THINGS GROUNDHOG, we’ll be firing up another year of superior stock selection as we launch Groundhog Challenge 2015 on February 2, 2015. It’s not too early to start thinking about your winners for 2015. Remember we welcome both individual investors and groups (investment clubs) … the ground rules are simple pick a minimum of FIVE and a maximum of TWENTY investments and we lock them in from 2/2/2015 through 2/2/2016. The average Value Line low total return forecast for the companies in this week’s update batch is 5.0% — a little higher than we’ve seen in the last few weeks. Fundamentals continue to erode slightly. This update did have a slight exception, with modest boosts to expectations for companies like Bristol-Myers (BMY), Lilly (LLY), Merck (MRK) and Teva Pharma (TEVA) along with various other drug-related stocks. Pfizer (PFE) was a notable exception — with a slightly reduced long-term forecast. Pfizer (PFE) dropped from $35 to $30 for the 3-5 year low price forecast. Teva Pharma (TEVA) went from $55 to $60 for the 3-5 year low price forecast.